Once again - I realized too late... "I should have taken pictures!?" Doh. The book party for Jen Carson was a blast! Just the right sized mini-mob showed up so we could all work on our own mini-bear head pin. Jen is an excellent teacher and coaxed us all into not only designing our own patterns, but cutting fabric and stitching up our little creatures. She started us with a very basic bear head pattern, but we all ended up morphing our creatures into everything from tiny white rats, to a made up, reversible creature, to my badger-bear. My badger bear ended up a lot bigger than I had intended because of a little piece known as the gusset. He's the one on top of the water bottle... he is still thinking if he wants to be on a stick, like a jester's puppet, or maybe attached to a badger body. He definitely will NOT be a pin! 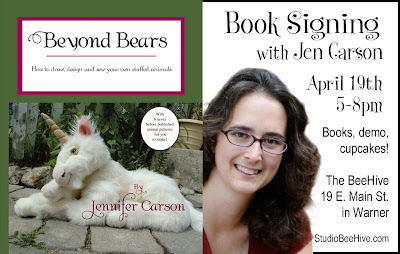 The workshop was a great example of why we all need Jen's book - Beyond Bears - How to draw, design and sew your own stuffed animals. I love to make stuff - but I always want to make it my OWN. I hate using other peoples' patterns. This workshop was very "Zentangle-y" in that we all started with the same basic instructions and very similar patterns, but the results were so totally personalized and distinct. Love it. Oh, yes - and there were bear head cupcakes too! As an added bit of excitement and challenge for TangleU participants, my publisher, Fox Chapel, and I decided to host a contest with Elaine Huffman, the TangleU organizer. 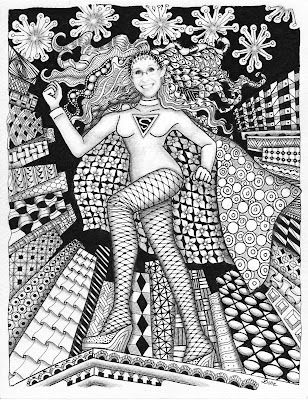 The contest was open to all CZTs (Certified Zentangle® Teachers) and the only requirement was that they use an image from my book, Tangled Fashionista , as their starting point. It's Me?! Chris Titus' Grand Prize winning tangled art from Tangled Fashionista. It's a really big file since it is chock full of ART! Gorgeous art! Design Originals also posted all the art on their Facebook page. That's a great way to see it all if you don't want to do any downloading. But the pdf has extra info and tips added to the pics as well as contact info. If you have been at a loss as to how to use Tangled Fashionista , this collection of art will get your creative juices flowing! By the way, Chris' grand prize? 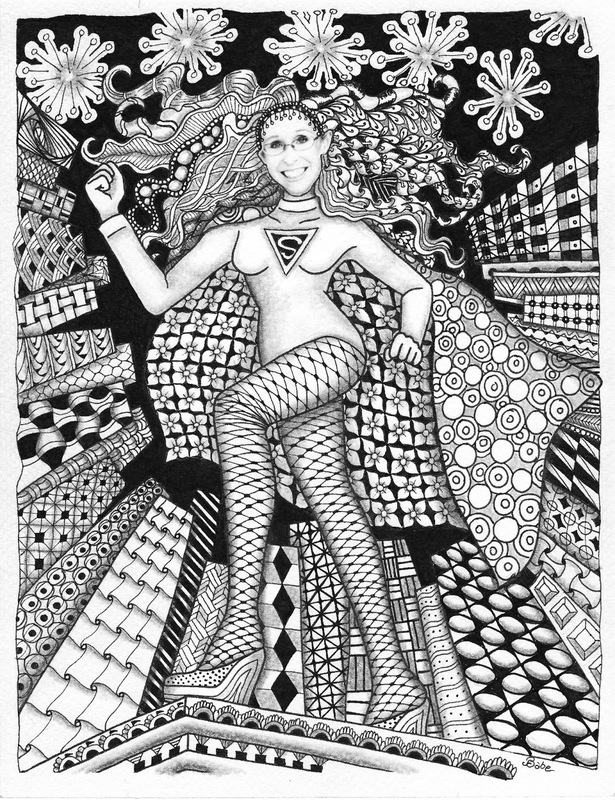 The COMPLETE collection of Zentangle books from Design Originals/Fox Chapel! Awesome! 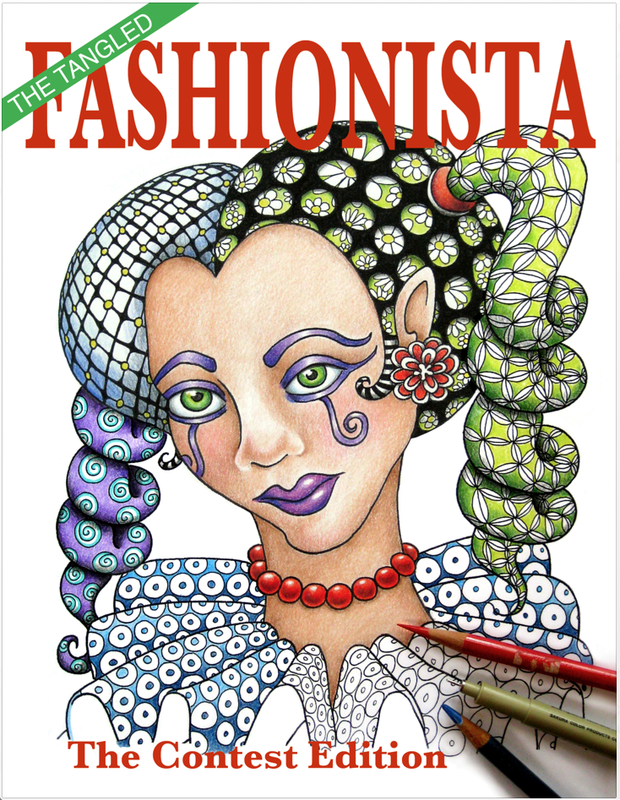 If you are all excited now - get to work tangling your own Fashionista artwork. 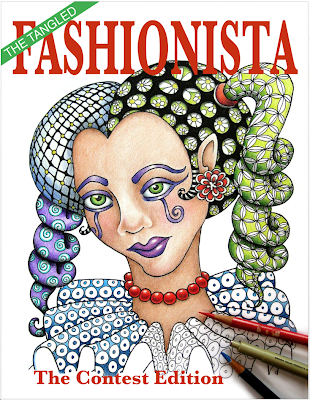 I'd love to do a revised edition of Tangled Fashionista sometime and include even more inspirational pieces. Still not quite sure about getting yourself a coloring book? Sure, I get it. This one was designed to be a spoof of all those Fashion Magazines out there, so it is kind of whimsical/silly and geared toward big people. Yes, like you. So, anyway, if you like to "test" things out first, head on over to my website: www.SandySteenBartholomew.com and download a few pages for free. Then get to work! Yes, I can see the comments now "But I don't live close enough to come to your store..." So let's do an online sale too, OK? This sale will be for 15% off everything in my Etsy store, Bumblebat. with a $20 minimum purchase. Sale ends April 18th, in the evening sometime. Sound good? Be sure to enter the coupon code: SPRING13 during the check out process for the discount to take effect. (It doesn't count if you email me the code, I can't change your order.) Oh, and this sale is good until Thursday night. After that, the shop will be closed for vacation. Starting this weekend, I will be away on an adventure for a few weeks and I'll be putting both the Etsy store and the web store on "Vacation Mode". That means I can't accept any orders because I'm not here. So, if you will be needing any books before May, please order ASAP or order directly through Fox Chapel or Amazon. The shops go into Vacation Mode on Thursday night. Remember, you can get the books at wholesale on the web store, but the Sale is only on the Etsy store. Speaking of Amazon, you may have noticed my fabulous, mysterious Tangle Cards are listed for "Pre-order". Yes, coming soon! Amazon says Sept. 2013, but I'm hoping it will be sooner. When I know for sure, I will give you all the nitty-gritty details. If you can stop yourselves from pre-ordering from Amazon and wait to pre-order from ME... I will award your patience with special, secret, limited edition... stuff. ;-D All I can say right now is you are SO GONNA LOVE THESE CARDS. Yes, I AM yelling! 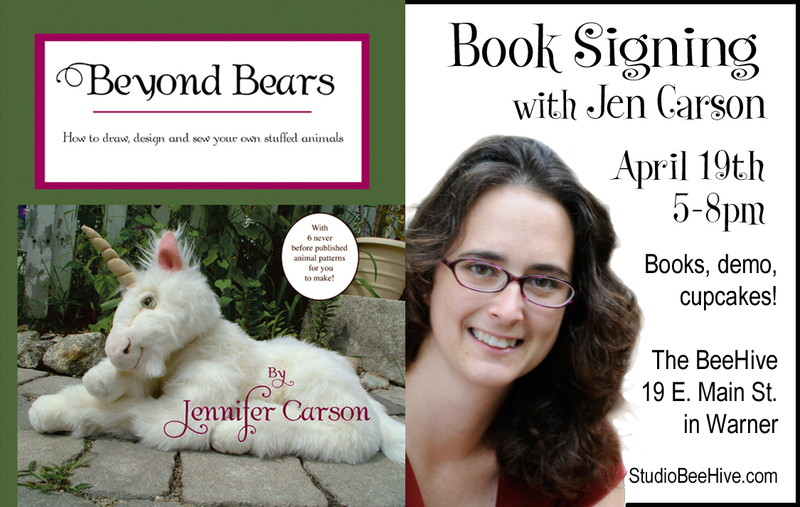 Don't forget about the Book Signing Party for Jen Carson this Friday, the 19th of April. It's from 5-8pm and it's going to be a blast! As extra incentive, I've decided I need to clear out some more space - I'm having a sale in the studio! 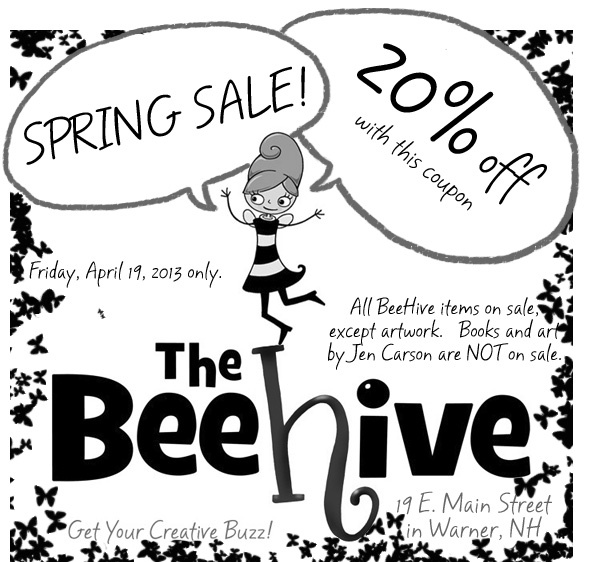 The sale is for 20% off everything - all books, art supplies, toys, and gifts. My original artwork is NOT on sale, but prints and posters ARE. Also, any of Jen's books or artwork are NOT part of the sale. If you have been eyeing a certain book, or teapot, or adorable little camera case... or rubber stamps... now is the time to get it. I'm not likely to do another sale INSIDE the studio for quite a while. Here's the coupon - you need it - this is a "Secret" sale just for you. Note: If you are new to my blog or can't quite remember who Jen is... take a look at my blog post from last March. This party is all Jen's and there won't be a giant castle cake, but other than that, it will be great! Hey folks - the Art Journaling In Paradise Retreat is now open for sign-ups!! Jessica said she posted it on her blog and emailed those of you on her "list" and we already have 8 people signed up! I'm kind of blown away by that - but if you are wanting to go, that means you need to sign up ASAP since we are going to try and keep this a cozy size. If you are like me, then you are worrying about pulling the money together, but there is even a great payment plan for us "budget-ers." :-) And, seriously, the whole thing is an incredible price. A few things to note... "Paradise" is not the beachy, ocean-side kind of paradise. Although there will be plenty of sand, this is an "artist paradise." Santa Fe is full of galleries and glorious vistas, architecture and art. It's like leaving the country without... uh... leaving the country! Another thing to note is Jessica's explanation of art journals and the tempo and spirit of this retreat. Although ALL levels of experience are very welcome, if you are the type who wants to move quickly from technique to technique and pack in the experiences... you won't be happy at this retreat. If you are looking for a slower adventure and an escape from your hectic regular life... if you have an open mind and want time to percolate your ideas... if you like piña coladas and getting caught in the rain... oh, sorry, the piña coladas are optional! Jessica has some examples of her "art journals" at the linked page and here is one of mine as well. There are great worksheets, time (offline) to do your "homework", and the best part (for me) the Q&A sections. I find I am always thinking "Yeah, but what if...?" and this actually gave me the chance to say that out loud and get some really useful feedback. At the end, we state what we will be working on, our goals, what we want to be held responsible for. For me, it was cleaning up a bunch of untidy... messes... before moving forward with a bunch of great ideas. Normally, that would be the conclusion to a program. But the Napkin Note program includes a few follow up group calls and a few one-on-one calls with Ally over the next couple of months. I think these calls were the key part for me- they provided the accountability I so desperately needed. Thursday was my final call with Ally. And when she said "Wait a second, do you realize that you did everything you set out to do, cleaned up those messes... I hope you are planning on celebrating your success?" I realized it wasn't just accountability I needed, but acknowledgement! Yes, I'm no longer 8, but I still crave those gold stars! I've had some requests from people to do mentoring or coaching, but that's not my path right now. So if you are one of those people, YOU want to work with ALLY. 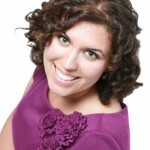 She's like me... super creative and great at brainstorming, but she is much calmer, knows what she is doing, and knows absolutely EVERYTHING about marketing. Yes, she actually overwhelmed ME with all her great ideas! How often do you put your business dreams on the back burner? If you're like most small biz owners I meet it's pretty darn often -- between serving clients and customers, family commitments and other obligations you have a lot going on. It's easy to focus on everything else. "I'll get back to that next week," you say. But next week comes and goes and nothing moves your business forward in the direction you want to take it. The thing is, it's when you invest time in your biz that the magic happens. I've seen evidence of this in my own biz. I've watched this happen for my clients. What if you gave your biz the gift of just one day. One day to get incredibly clear on your direction. One day to make important decisions that affect your earning potential. One day to learn about systems you can put in place to put your marketing on autopilot. One day to map it all out so taking action is easy. Commit to just one day and you can change the course of your business. If you're finally ready to create the business you want -- one that works for you -- I invite you to join me for one of my two upcoming Napkin Note Biz Plan workshops. It's a virtual day of working on your business and getting things done. Two dates are available before summer -- April 22 and June 7. And when you register before Thursday, April 18th you'll save $100 off the regular workshop price. Stop putting what you want on the backburner and start going after it NOW. 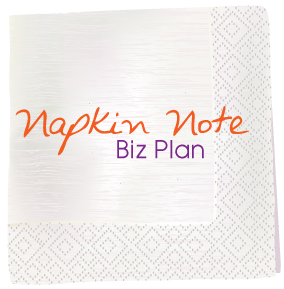 Let me show you how at my NapkinNote Biz Plan workshop. 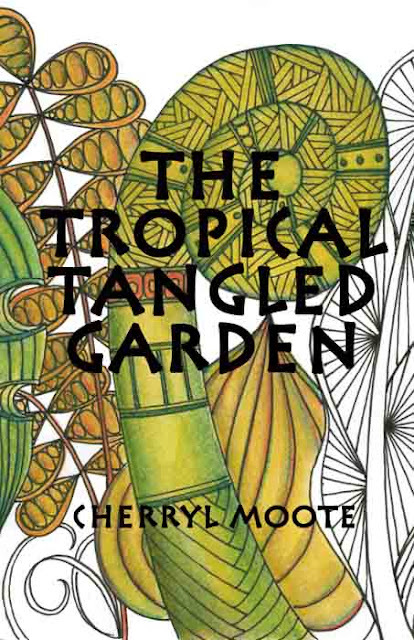 Below is the official announcement from Cherryl Moote about her new book. I had the chance to take a look at it last week and it's lovely. This is not a Zentangle® book, but rather, a how-to-draw-plants book that uses the Zentangle approach to drawing. It also has interesting facts and observations about the plants and how to use them in your own artwork. Also note that this is a "real" ebook, not a pdf, so you will need to have a device and software that can read this format, ie: iBooks on an iPhone or iPad. Moote Points is excited to release our first ebook! To purchase, go to: www.mootepoints.com/ebooks.html. This booklet is the first in a series of Tangled Garden titles. The Tangled Garden Series offers tanglers and garden art enthusiasts the opportunity to explore a variety of types of gardens and drawing styles while creating drawings in a relaxing, playful and colourful way. Each book in the series will be available as an ebook that is overflowing with vibrant colour and verdant greens, encouraging watercolour and coloured pencil enthusiasts to add a splash of visual impact to their work. Step-by-step instructions for drawing and generous examples of sketchbook and finished artwork are featured throughout the series. A print version of the series will be published in 2014 collecting the ebook titles from the series into The Tangled Garden (ISBN 978-0-9784951-7-6). I am aiming for March 2014 for the book as the latest date for publication. It will likely be about the same number of pages and price as All Tangled Up which means around 120 pages and $40. We will sell it through the retailers that carry it online, CZTs and our own website. Amazon isn’t a possibility for us at this point as our post office is really slow and I just can’t do mailings every day to meet the rush orders.